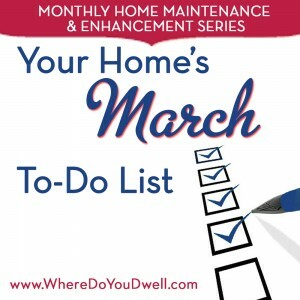 Here’s the next installment of our monthly series, “Your Home’s To-Do List.” Each month we spotlight what home tasks you should tackle at this particular time of the year. In addition to our basic maintenance reminders, we also suggest ways to enhance your home’s value and how to “Dwell” happily! By focusing now on these tasks, you and your family can look forward to spending more time relaxing and enjoying your home for the rest of spring and into summer. If you can’t accomplish some of these items or the weather doesn’t cooperate, move them to your April list. So let’s get going … March 21st is the official start of spring! Open the windows and blast some music to make these to-do’s more fun. Schedule some time over the next few weekends to deep clean your home from top to bottom. Remember to always follow your manufacturer’s cleaning instructions for any items. Windows. You want to see clearly the first blooms of spring so wash windows, wipe down sills, and clean screens by vacuuming first and then rinsing with a hose outside. Some of you may want to wait until the yellow pollen season is over to do this or you may need to repeat again. Also, we have a great window washing suggestion. They can clean each window for about $5 per window, might be worth it! Floors. Wash and polish those hardwood floors after the beating they got from winter boots and wet paws. Clean yucky tile grout to make your bathrooms and kitchens shine. If you have ceramic tile, the grout can start to look dirty and stained. An old toothbrush and some vinegar and baking soda are a good start. You can reseal the grout or stain it with new color too. For tiles, give then a deeper clean than usual and reseal if needed. We love Stanley Steamer to steam clean tile and grout — looks good as new in no time for a small cost. Electronics. Wipe down all of your electronic devices — TV and computer screens, printers, DVD players and keyboards too. Use LCD or microfiber cloths to rub away fingerprints and dust. Set up an organized charging station or stations within your home so your family has a go-to place. Chimney/Fireplace. Clean up any ashes after your last fire of the season and close the damper to prevent rainwater, animals, and drafts to enter your home. You might want to schedule any maintenance on your chimney now (such as repointing) so that you aren’t rushing to get it done later in the year. Washer/Dryer. Run the cleaning cycle with bleach if you have an HD washer to cut down on mold and mildew smells. Don’t forget to regularly vacuum out lint from the dryer vent and hose to avoid a fire. It’s important to have your dryer vents professional cleaned every few years! Kitchen. Actually use your oven’s handy self-cleaning feature to remove food drips and spills after all the holiday cooking over the last few months. Clean your old-school coffee maker with vinegar so your next cup is truly fresh. Refrigerator. Give your refrigerator a good wipe-down inside before your next big shopping trip. Don’t forget to change your refrigerator filter if you have an ice cube and water dispenser so you’ll get fresh tasting glasses of water. It should usually be done every 6 months but check with your manufacturer’s guidelines. Paint. It’s a perfect time to pick a bright new color to spark up a dreary room. The rainy season will be upon us before you know it. March is a good time to get prepared inside and out so you are ready for April 1st. Doorways. Make sure you’ve got inside and outside door mats for wiping wet shoes. Switch them to a fun spring pattern if you have ones from winter. Get an umbrella stand or colorful tub for easy in-and-out access for all your wet umbrellas. Gutters. Double check your home’s gutters, French drain system or downspouts to make sure they are clog-free and water is moving away from your home’s foundation. Fix any broken or loose gutters from winter storms. Rainwater that pools can really damage roofs, ceilings, attics, and walls! Drainage. Observe your lawn during the spring thaw and rain to address any drainage issues. Clear all drains of leaves and other debris that have accumulated all winter long. If you see standing water, hire a contractor/landscaper to examine any problems with standing water or lack of adequate draining. You’ll have a better idea of the cause and consequences (basement flooding) of poor drainage. Proper grading, a French drain system or curtain drain may be needed. If your entire street has problems you can always contact your local government if it’s municipal issue. This month and next is the time to focus on your yard and any outside maintenance of your home as the weather warms up. In the DC metro area, we usually don’t have to worry about late snowstorms but you just never know. Give your yard and the exterior of your home a good examination to see how everything looks and for any winter damage. Clean up. Take the time to remove debris such as dead foliage and fallen branches and twigs that may be scattered in your yard. Clear out any growth or brush you don’t want. Be gentle raking and walking on your lawn at this time since new grass shoots will start to peek through. Patio. Clean and prepare your patio or deck and any outdoor furniture or planters. Consider power washing to get rid of grime on some items that can withstand the pressure. 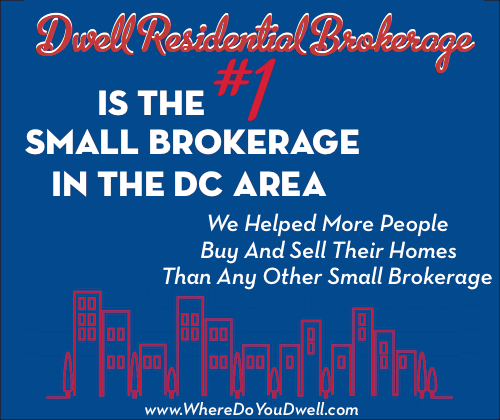 It depends on what material you may have –pavers, concrete, slate etc. Or, give everything a good deep cleaning so the rest of the year, you can do a periodic wipe down. Grill. It’s time to crack open those BBQ recipes! Get your grill cleaned and repaired now. Scrub the grates with liquid cleaner, and wash the burners and covers if you have them. Make that grill sparkle and shine. Don’t forget to get the tank filled if you have a gas grill, or stock up on charcoal for other grills. Critters. With the warm weather, little critters start to come out so hire a service that can help you deal with ants, rats, spiders, or mice. Make sure your garbage is securely closed and clean up any areas that may look like a cozy home for critters. Driveway. Winter weather can be harsh on driveways and sidewalks. Repair cracks whether you have concrete or asphalt. Sealing or resurfacing can give a driveway a bright lift. If you have pavers, make sure you know how to clean and re-sand; or hire a professional. Flower garden. Depending on the last frost date and our hardiness zone, you can begin to plant summer bulbs, annuals, and perennials for beds and planters. No matter what the weather, come up with a plan so you purchase only what you need and what works for the soil and sunlight in your yard. Cool spring weather is good for pansies in containers. It’s also a good time to order your mulch so your yard will look “clean and crisp” in the coming weeks. Trees and shrubs. Cherry blossom season blooms this month — peak blooms are expected March 18-23rd. Your own yard is probably showing signs of spring now. Once you see growth or buds sprouting, you can fertilize and prune certain plants. You can transplant trees before they leaf out. Prune trees and shrubs that have any damage from the winter. You can’t prune azaleas, camellias and rhododendrons until after they bloom. You can prune nonflowering trees and shrubs. Keep in mind, you’ll have more time in April to finish up garden and outside work as the weather becomes more consistently warmer (but remember you could be hit with lots of rain!). By focusing on serious yard clean up now, you’ll have more time “beautifying” your yard and home next month. Keep posted for our next installment — we’ll give you some fun April projects to make your outdoor space perfect for relaxing!